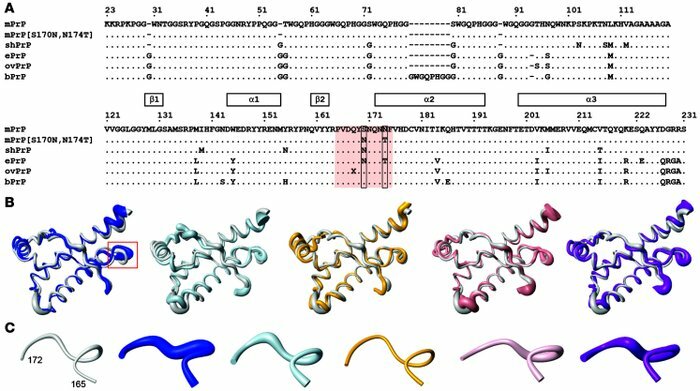 Amino acid sequence and 3-dimensional structure comparisons for WT mouse PrPC (Prnp a), mouse RL-PrPC, and for WT-PrPC of 4 additional mammalian species. (A) PrP amino acid sequence of PrP from mouse (mPrP; Mus musculus, AAA39997) and the RL variant thereof and Syrian hamster (shPrP; Mesocricetus auratus, AAA37091), elk (ePrP; Cervus elaphus nelsoni, AAB94788), sheep (ovPrP; Ovis aries, ABC61639), and cattle PrP (bPrP; Bos taurus, ABU97893). For mouse PrPC, the residues 23–231 are shown. For the RL variant and the other species, the only amino acids indicated are those that differ from the mouse PrP sequence, with identical amino acids indicated by dots and deletions indicated by dashes. The shaded region indicates the β2-α2 loop region, and the “X” in the ovine indicates a polymorphic residue position (Q/R). At the top, the regular secondary structure elements are shown. (B) Backbone superpositions of residues 125–228 of RL-PrPC (gray) with mouse PrPC (dark blue), Syrian hamster PrPC (light blue), elk PrPC (yellow), sheep PrPC (pink), and cattle PrPC (purple) (adapted from refs. 44–47, 51). A larger view of the region in the red box is shown in C. (C) Backbone fold of residues 165–172 in RL-PrPC, mouse PrPC, Syrian hamster PrPC, elk PrPC, sheep PrPC, and cattle PrPC. The radius of the cylindrical rods representing the polypeptide chains is proportional to the mean global backbone displacement for residues from 20 conformers used to represent the NMR structures. The same color code is used as in B.